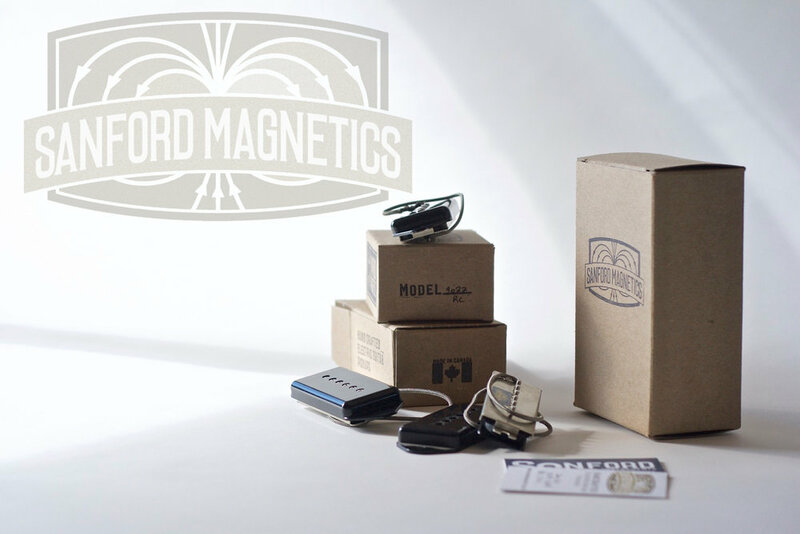 To prevent becoming a spambot, I made a Facebook Page for Sanford Magnetics. The clips page is now live. Started off with 3 different clips of a few different models, with more to come soon. I intended to have someone else play on the clips, but something came up, I ended up doing it my self. Making these things gives you some insight, I'll never say anything bad about anyone's clips ever again. As soon as the camera starts, you can't play anything. There's a difference between playing at home, in front of people...and a camera. Youtube changes the sound and adds video and audio compression, there's a quite a change from what you hear in a room, to what you hear on a monitor, to YouTube, but everyone is dealing with the same thing...it is what it is. I edited the raw footage on my Mac, so I'm sure the transitions look a little rough and there's some weird edits, but they turned out somewhat watchable. Maybe next time I'll hire some talent to play and edit these things. The clips were recorded by Ross Cole at Shattered Glass Productions here in Moncton. If you're local and were thinking of doing some recording, look him up. Bill of Materials. What's in a Humbucker. 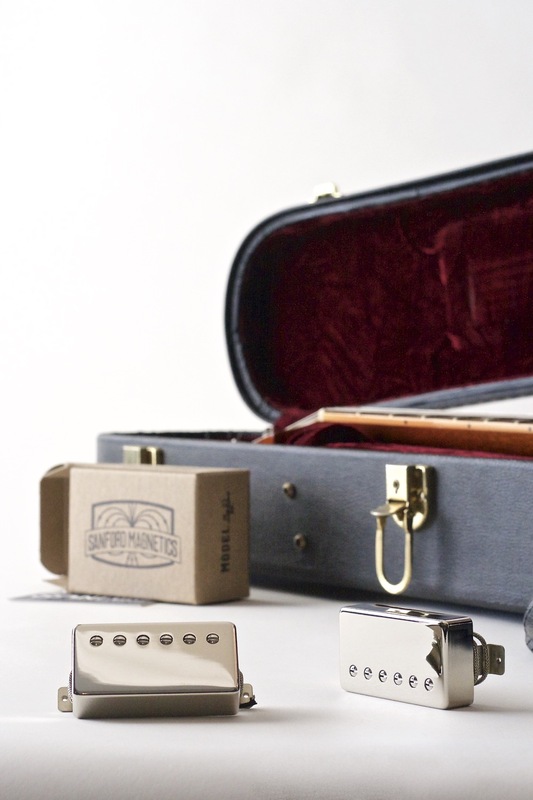 If you've wondered about the parts that go into a Humbucker. Here's the parts list. Parts laid out before assembly. Raw Nickel cover, Nickel/Silver baseplate. Butyrate Bobbin. Wire is wrapped around it to create the coil. The original Gibson PAF called for 5,000 turns per coil, half of what it's predecessor the P90 called for. The original winding machines lacked an automatic stop, so the turns count could vary as the machine operator let them run over or under. Alnico bar magnets. These are graded by magnetic strength, A2, A3, A4 ,A5, A8 all sound different. The one pictured above is A4, a personal favourite. The metal keeper supports the screw side bobbin. The 6 Screw poles pass through to the baseplate. The type of steel used affects the sound of the pickup. The spacer supports the slug side bobbin. The one above is a maple spacer. Some pickups use a plastic spacer, but the original design called for maple. Maple will compress just slightly when assembling the pickup, keeping things snug, helps preventing microphonic feedback when making an unpotted pickup. Here's the spacer, magnet and keeper laid out on the baseplate. You can see how the pole screws pass through the keeper. The space beside the magnet on the right is for the slugs and the maple spacer supports the bobbin. Notice on the far left there is a space for the braided shield conductor. Pole Pieces. Nickel plated steel. The carbon content of the steel affects the tone of the pickup. The screws are 5-40 Fillister head screws. The original Seth Lover design called for two slug pole bobbins, but the execs thought having an adjustable pole piece was a good marketing feature, so they went with exposed screws on one side of the pickup. Brass screw attach the bobbins to the baseplate from the underside of the baseplate. 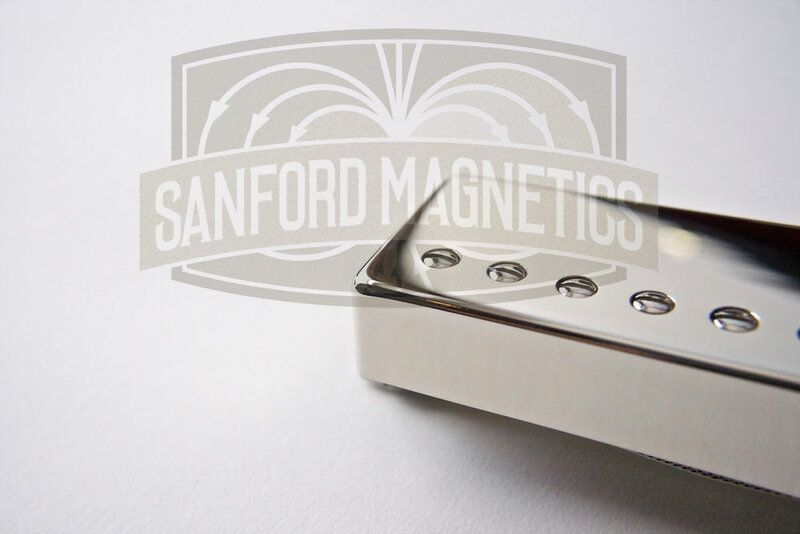 The screws are in the magnetic field of the pickup, so the metallurgy can affect the tone. For comparison, here is a regular ABS plastic bobbin on the left and a Butyrate bobbin on the right. A pic of my current amp setup. I've been a Dr Z user since 2002. Hand wired PtP construction, turret board wiring. Pretty great value for the money if you're looking for made in the USA, hand built amp. The Bottom one is a Maz Sr NR Head. I run that into a Z-best 2X12" loaded with a couple 50 Watt Alnicos from Weber VST. A Silver Bell and Blue Dog. The top head is a 2008 Anniversary RT66. A couple KT66's, an old Mullard EF86 and a GZ34 and Ultra Linear. The RT 66 goes into a Dr Z Airbrake then to Z open back 2x12" with a G12H30 and a Greenback. Super A8 and Custom Neck build. Figured I'd post a pic of a couple pickups before I shipped them out. Super A8 on a Short Leg baseplate and a Custom Wound Neck Humbucker in chrome. Looking at the traffic statistics, it seems some of you found the pictures of Buddy. If you're going to pay for webspace, might as well use it. In case you were wondering. Ol' Bud is 5 and ½ years old. He's half retriever and half standard poodle, weighs in at 90 pounds. He didn't get any of the curls and he sheds. He leads a spoiled life. I wanted to point out, I won the dog jackpot. It's been a week since the site launched and the response has been great. Didn't expect to see the amount of traffic it's been getting, safe to say it's exceeded my expectations 10x. A metric tonne of work went into making it, rebuilt it half a dozen times. Resisting the urge to add clutter and turn it into a modern Geocities mess can be difficult, to say the least. It's probably a walk in the park for a web developer type, that's not me. Hope to have clips and video posted after the weekend. Big thanks for the orders, hope you folks enjoy your pickups. The site needed a place to post updates and information, without adding to the clutter, so here it is. I'll try not to post too much spam or other such nonsense...and probably keep the navigation in the footer.